The popular Saint's Row franchise from THQ and Volition has arrived just before the Christmas shopping season, but will Saint's Row The Third be on gamers' wish lists, or be as wanted as lump of coal? Another War Is Brewing: Saint's Row The Third takes place after the events of Saint's Row 2, in which the Third Street Saints gang defeated all of their enemies and took control of the city of Stillwater. After seizing control of the city, the Third Street Saints merge with the stereotypical big-business Ultor Corporation and become celebrities amongst the people. When the gang decides to rob a bank along with Josh Birk, an actor researching his role for the upcoming Third Street Saints movie, the job goes horribly wrong thanks to Birk. After a firefight ensues, the group is imprisoned for their attempted robbery. While in jail, the group is bailed out by another, more sophisticated gang called the "Syndicate", and taken to the leader of the Syndicate on his private jet who offers them a deal. They are allowed to live if they give up 66% of the revenue earned in Stillwater. The Third Street Saints refuse and a firefight breaks out mid-flight. Without giving anything more of the story away, I can say that while the plotline is very over-the-top and pretty ludicrous, it does seem to progress fairly well. The missions that you undertake often involve seizing control of rival gang territories, killing rival gang members or, well, you get the idea. The story is obviously no Shakespeare, but it does a good job of keeping along a set line. Even early in the story you will see some twists and the plot escalates nicely over time. Playing God: Before you jump into the world, you are tasked with creating your own character that you will use throughout the game. You can obviously choose from male or female gangsters, but aside from that I believe the customization options will surprise many people. The amount of things you can change, alter and distort when molding your protagonist is simply insane and I can safely say it rivals games known for their character customization such as the Elder Scrolls RPG series. Your head, eyes, ears, nose, mouth and body can be meticulously fine-tuned to your desires in a variety of ways from shape, width, size, thinness/thickness and many other ways. Not only changing your facial features (and how in-shape your character is), you can even change the color of your skin! I don't mean from Caucasian to other races, I mean actually color your character's skin like he/she is a picture in a coloring book. You can choose to make him extremely pale, extremely dark, blue, orange and virtually anything in between. We personally opted for a green, muscular creature that looked very much like the Hulk (or a green version of Beast from X-Men, you decide). Taking Back The City: Once you get past the first couple missions, you are unleashed out into the world and in typical free-roam style, open to do whatever you want, at whatever pace you choose. You will be lacking on cash early on, which will severely limit the amount of things you can do, but even a penniless gangster can still have some fun. Without even touching the main storyline, you can batter and take the money of random people on the street, drive around simply ramming into police vehicles and rival gang cars, run over to gang controlled territories and attempt to take control of it (by, of course, killing a ton of said gang members) or even do some more meaningless things such as customize aspects of you see. By that I mean you can walk into clothing shops and buy everything from hats, glasses, rings, bracelets, shirts and jackets to dresses, sweat suits, pants and shoes. As well as playing dress-up with your character, you can also buy upgrades for and change the appearance of any vehicles you choose. If you happen to steal a Hummer-like vehicle while running around the city, you can take it to a customization shop and outfit it with reinforced plating to make it better protected from damage, spikes on the wheels to damage other vehicles, and even small things like change the color of the body of the car or the tint of the windows. Back And Better Than Ever: The overall gameplay in Saint's Row The Third is very important in this title though, especially considering the disappointment Saint's Row 2 brought to many gamers. 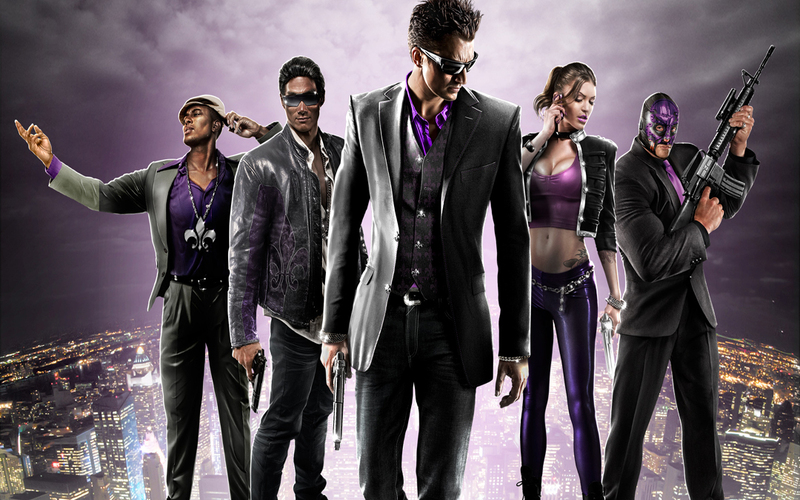 Fortunately, I believe Saint's Row The Third is better than ever as far as its gameplay/gunplay goes. The gunplay is not as "weighted" as a pure shooter such as Gears of War, or even Grand Theft Auto IV, and all the characters and vehicles move around in a somewhat comically quick kind of fashion. However, despite that fact I do not have a big issue with the way the characters move around. As far as the actual firefights go, I feel this title is a big improvement upon Saint's Row 2. You will often be facing large hordes of enemies no matter the situation (whether you brought the wrath of the authorities upon you or simply battling with rival gangs), but the weapon selection and gunplay is actually pretty decent. It isn't "deep", mind you, and there isn't a real cover system in place aside from crouching and walking behind something protective, but squaring off with waves of hostiles while using some interesting weapons can make for some fun. You can use everything from Riot Shields, shotguns and assault rifles to even your bare fist, not to mention some of the more hilarious weaponry at your disposal (think the shock paddles from Saint's Row 2). As well, I was impressed with seeing enemies react to where they got shot. Pop a cap in somebody's knees and their legs fall out from under them as they die, and the same can be said for shots that even hit the shoulders (they turn when they get hit and react accordingly). In addition to outfitting yourself in new clothes, customizing your ride and striking up battles with well-armed forces, you can also take control of the city of Steelport by buying local businesses. From strip clubs to simple produce distribution locations, you can buy businesses around the city and take in money every hour from the businesses you own. Eventually you could own half the city and rake in thousands of dollars every hour! The Gritty City Of Steelport: The visuals in Saint's Row The Third are probably where I have seen the biggest issues. The game does not look terrible, and the character models are actually very well detailed and look sharp, but the environments can be a bit drab. Some of the buildings around the city look very solid, but others, for some reason, lack detail and bring back bad memories of Saint's Row 2's poor graphics. However, without a doubt Saint's Row The Third is a pretty big improvement upon the visuals featured in SR2. The voice acting in Saint's Row The Third is also top notch, with a variety of voice actors being featured in this title. Even some celebrities like Bert Reynolds and Hulk Hogan have lent their voices to the game, and everyone does a pretty good job of bringing life into the characters. Rent vs. Buy: Saint's Row The Third keeps you very intrigued from the start of the game, and the sheer amount of random things to do can keep you entertained for hours on end. Just looking through all the clothing options in the game can take up some time, not to mention taking over businesses, doing the main storyline or just causing havoc. Everything I've seen from this title has been a huge improvement upon its predecessor SR2, and the over-the-top action showcased in the game can make for some surprisingly funny moments (simply taking off all your clothes, underwear included, and streaking the town while beating people can be entertaining, as crazy as it sounds). SR2 fans will undoubtedly find a home for Saint's Row The Third, and I am just waiting for the game to run out of things to throw at me. As well as the single player, the multiplayer portion of the game can be looked at. There are multiple modes to choose from, but so far I have not seen a whole lot of change from what was featured in SR2. The classic names for the game modes return, but the gameplay seems primarily unchanged. Not a bad thing by any means, especially if you loved SR2's multiplayer, but I feel the social aspect of Saint's Row The Third will require certain tastes in order to be appreciated, since this is a far cry from real shooters like Call of Duty or the Battlefield series.